If you want to be sure that you’re buying what you truly need, you need to know everything about the product. The Greenworks pressure washer reviews will give you just that – the good, the bad… The unbiased FACTS. The Greenworks pressure washer reviews will give you all the information you need to choose just the right product for your cleaning tasks. 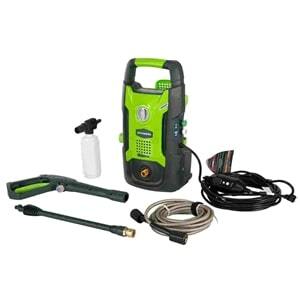 The first product on our list that’s up for review is the Greenworks 1500 PSI 13 Amp 1.2 GPM pressure washer. With it’s easy to assemble parts and the stability it offers, it makes up for a perfect household tool for light cleaning. It can also be used both vertically and horizontally, which can really make pressure washing easier. The total cleaning power score of this unit is 1800. This pressure washer comes with a turbo nozzle that can be used for cleaning surfaces such as your patio, driveway or even the facade of your home. Also, this unit has a bit longer power cord than the rest of the pressure washers – 35 feet in total. This power cord has an inline GFCI safety measure, so you can use it freely on all exterior outlets. The high-pressure hose can reach up to 20 feet, which is enough for cleaning the siding on the house, but not the second story. This unit has only 18.4 pounds and is really easy to carry around. It also comes with 25 and 40-degree quick connect tips that make it suitable for cleaning a variety of surfaces. The removable detergent tank allows the user to fill it up and clean it after use with ease. 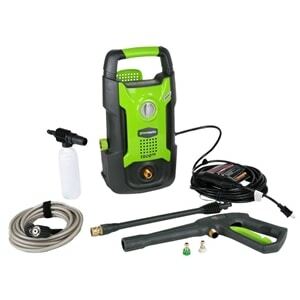 This small in size and low in price Greenworks pressure washer comes with a one-year warranty. The best thing about this pressure washer is the fact that it’s compact, light, easy to move around and store. The balance between power and price makes it a good investment. Also, it’s easy to assemble. This model of Greenworks pressure washer is light in weight, but it packs 1600 PSI at 1.2 GPM. It will help you get rid of the grime and dirt with minimum efforts. This unit can also be used both vertically and horizontally. Just like the previous unit, this one is also small in size and weight. The pressure hose is high-quality and can reach 20 feet with ease. Still, with 1600 PSI, it’s a great tool for light and medium cleaning, but not heavy-duty tasks. The 35-feet electric cable comes with an inline GFCI safety. With the 25-degree tip, you can wash away the dirt and mildew, and also prepare surfaces for new paint jobs. You cannot strip the existing paint, however. The 40-degree tip is perfect for washing the windows and vehicles, and anything that requires lower water pressure. The quality of product manufacture adds a professional note to this household cleaning tool. Achieving spotless results has never been easier. With the water flow of 1.2 gallons per minute, this product will help you wash your patio furniture, decks or your vehicle, much better than you would do with a regular garden hose. With 1700 pound per square inch of pressure, any amount of dirt will be easily washed away. The total cleaning power of this unit is 2040. 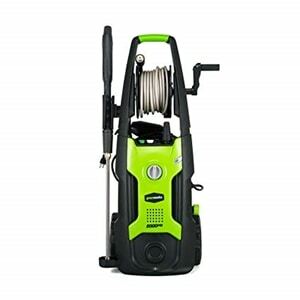 One of the main perks is the incorporated hose reel that helps the user pack up and store the power washer with ease. It makes less noise than the gas pressure washers and is, therefore, a better choice for both the environment and your house. Its 25 and 40-degrees quick connect tips make this power washer perfect for various surfaces. It comes with a removable detergent tank that can easily be filled and washed after use. This model comes with a 35-feet power cord with inline GFCI for use on all exterior outlets. This Greenworks pressure washer can be used both vertically and horizontally. This pressure washer is stronger and in many aspects better for the household use than most products on the market in this price range. Greenworks was founded in 2007, with its headquarters in Mooresville, North Carolina, and has been growing in size and quality ever since. The company was founded to present the industry-leading lithium-ion technology and outdoor power equipment produced by a parent company – Globe Tools Group. Greenworks has come a long way since their beginning – today, it is a famous pressure washer manufacturer for residential cleaning purposes. Greenworks is a company that keeps up with the needs of the market, but also constantly works on improving their tools so that what their customers need as well. In 2010 they introduced a powerful line of corded outdoor power equipment designed for the needs of residential consumers who wanted pressure washing power without noise, fumes or hassle. Always coming up with new and exciting products, in 2011 Greenworks brought a G-24 line of battery-powered tools to the industry. The 24-volt line uses a 24-volt Li-Ion battery that offers fade-free rechargeable power – an issue many battery-powered products face. This feature can be used for indoor hand tools and outdoor power equipment as well. 2011 was also the year when Greenworks introduced electric pressure washers that produce PSI levels comparable to gas models. In the next years, they introduced a number of new and exciting tools that caught the attention of the people around the world. Greenworks provides a budget-friendly solution for residential cleaning, and they have a reputation of being quite customer-oriented. With a rapidly growing number of satisfied costumers, Greenworks easily became the industry leader in battery-powered outdoor power tools and power washers. Their target audience is mainly comprised of DIY-ers and landscapers – in just 11 years they have grown their business to unfathomable heights. Greenworks branded products include 24-volt, G-MAX 40-volt, 60-volt, 80-volt, and commercial grade 82-volt battery-powered outdoor power equipment, as well as a full line of corded equipment and power tools. They are most famous for their efficient and cost-effective pressure washers and additional equipment. All Greenworks products come with a four-year warranty, except the pressure washers that carry a 1-year warranty. Lithium-ion batteries carry a two-year warranty against defects in workmanship and materials. Sealed Lead Acid batteries carry a one-year warranty against defects in workmanship and materials. The warranty, with a proof of purchase, includes a 90-days warranty if the product is bought for the commercial use. Greenworks has great customer service, and they offer repairs, replacements or a refund for any product that are defective, through normal use. The warranty also applies if the product has been damaged during shipping All this is free of charge for the customer, so you can rest easy knowing that you’re covered. The company specializes in cordless outdoor power equipment, electric-powered equipment, brushless motors, complete outdoor systems, and lithium-ion battery technology. With headquarters all over the world, they keep expanding and working on new ways and products to improve your home maintenance. 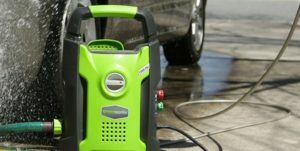 In these Greenworks pressure washer reviews, we, as Pressure Washer Lab, have analyzed the best-selling models in detail, so that you can choose the right cleaning unit. But if you want a Greenworks product with more power, you can check our Greenworks 2000 PSI Pressure Washer Review. With a superb line of residential power washers, you can rest assured that you have made the right decision.